A big shout out to all of you Dad's out there- mine of course at the top of that shout out list! We're spending the day with Mr. T's folks and heading to dinner at the ever so awesome Minetta tavern. I can't wait to try out their steak again and see if it truly is better than Luger's. Can't get a reservation at Minetta and need a place to take Dad? Why not the Frying Pan? It's supposed to be a beautiful day today so why not take your Dad somewhere to chill out and relax in the sun. Mr. T and I went again two Saturdays ago. 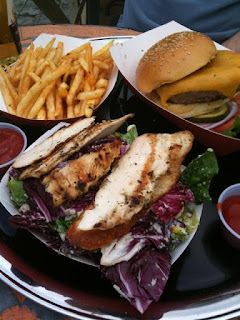 Although the Grilled Chicken Cesar salad wasn't quite as good as I remember (the chicken needed a little more crispy char) the burger was still great and man I could eat those huge pieces of garlic in the fries all day!